October is a month of change in most parts of the country. It may start out summery, and then end up feeling very autumnal. There are many themes that will work for this varied month, which makes it a wonderful time to plan a wedding. There are many special things about the month of October that you could use as a jumping off point for your wedding. 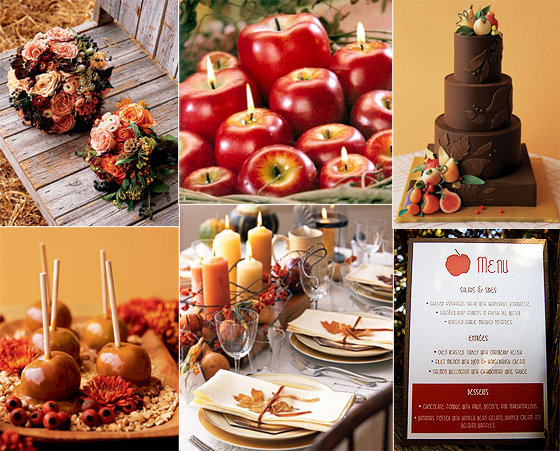 Naturally, the fall harvest theme is very popular at this time of the year, but by no means is it your only option. There is a suitable theme to match the taste and personal style of every bride and groom. One great idea is to base your wedding theme around the October birthstones, which are opal or rose quartz. These gems come in lovely and feminine colors which are perfect for an October bride who does not care for the rich and fiery tones of the typical fall colors. The opal is an amazing gem, because of its unique iridescence. Use that special glow to inspire your wedding attire and décor. For instance, you could look for opalescent table linens with the perfect amount of shimmer and glow. Trim your bouquets with the prettiest sheer and shimmery ribbons, and look for opalescent candles to decorate the reception tables. Many people picture the opal as being mostly white, but this is not always the case. Australian opals, for instance, are known for their incredible iridescent shades of blue and green. These watery colors could be used to great effect as the basis for wedding décor. The more white opals usually contain brilliant flecks of orange, blue, or green, so that could also provide a couple with ideas for a gorgeous color palette. To bring the look of an opal into your bridal ensemble, look for gowns with a touch of shimmer. You can finish the look off with opal bridal jewelry, if you choose. Another idea is to wear bridal jewelry that is handcrafted with Swarovski crystals with an "ab" finish. These beautiful crystals reflect all of the colors of the rainbow, which makes them perfect for handcrafted bridal jewelry when you want a little iridescence. An October wedding can also take its' design inspiration from the gentle pink tones of the other October birthstone, the rose quartz. This is a nice option for a bride who likes a traditional and feminine look for her wedding. Pink is a wonderful color to use in a wedding, as you will find so many things available in this color family. If you are an October bride, consider yourself lucky! You are getting married at one of the most beautiful times of the year. Best of all, you will have the pleasure of celebrating your anniversaries during this most lovely season year after year.